I found the mermaid at a garage sale out in the suburbs, right after reading “The Mermaid Chair” by Sue Monk. She is missing a finger, just like the crazy lady in the book who chopped hers off. I felt it was calling to me. The summer I found her, I surrounded myself with seashells and felt connection to the moon. I put her on top of the toilet tank lid, and there she sat, up on her giant shell bowl that would hold my barrettes and hair pins when I would take them out for my shower. She looks out at her empty hand, as if something was once there that she very much admired and oftentimes, I try to imagine what, if anything, it was. The hat is removable. I made it myself one day when I came home from a Christmas party . I had been moved by the Spirit of the Season and the beverages served, and felt inspired to make a Santa hat for every item in my home that had a head. I stopped at this one and went to sleep. I decided recently that I wanted to get rid of her. She collects a lot of dust and nothing else fits on the toilet tank lid when she’s on it, which kind of bothered me. The other day, I put her by the door, the place things go before they go out of it. Bill found her there and put her back. After I explained to him what I was doing, giving the mermaid away, he looked shocked and asked me “WHY?” I guess he liked her the whole time and I never knew, so I gave her to him and he seemed genuinely appreciative. And if the mermaid had feelings, I’m certain she’d be happy as well. 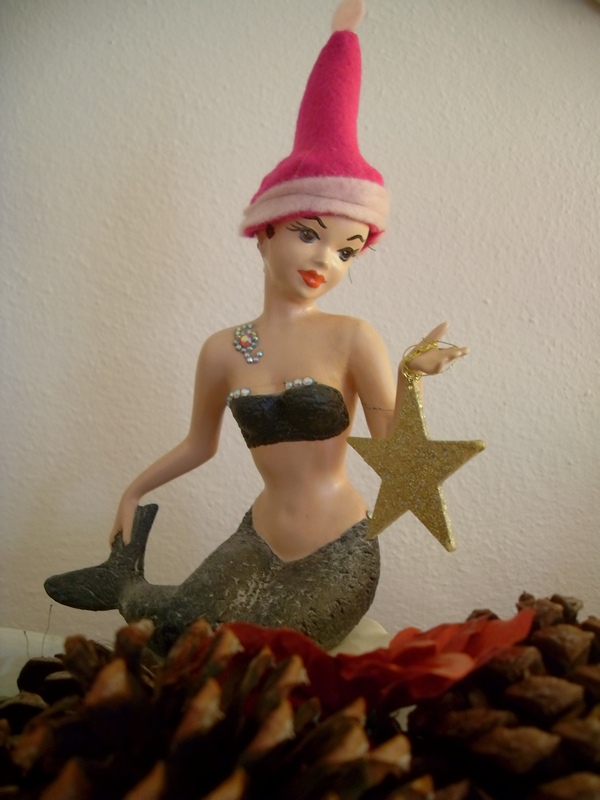 I like the mermaid and can understand why she appealed to you. The Christmas hat adds an unexpected, whimsical touch. Well, if Bill ever decides to give her up, I will be happy to pass her on to you, hat and all.